Juventus won the Supercoppa Italiana in Jeddah and match-winner Cristiano Ronaldo is hungry for more trophies. Cristiano Ronaldo celebrates his goal. 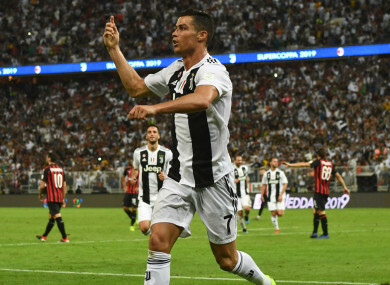 CRISTIANO RONALDO INSISTS Juventus are only just getting started after his header was enough to win the Supercoppa Italiana in a 1-0 triumph over AC Milan. The prolific forward made the breakthrough just after the hour in Jeddah, with Milan’s task made even more difficult by a late sending off for Franck Kessie. It marks the first medal Ronaldo has won as a Juve player since he joined from Real Madrid in a €112million deal in the close season and the Portugal star hopes this is the beginning of bigger and better things. Speaking to Rai Sport, he said: “It was a very difficult match, it’s very warm and hard to play in these conditions. Email “Ronaldo: Supercoppa triumph just the start for Juve”. Feedback on “Ronaldo: Supercoppa triumph just the start for Juve”.